The blacksmith in Konohana town can upgrade your Watering Can, Sickle, and Hoe if you accept his Tool Requests from the Konohana message board. The "Upgrades!" request will appear on the board at the beginning of the season if Sheng has at least 9300 FP. Sheng will have 10,000 FP if you see 2 flowers on his conversation dialog box. After accepting the "Upgrades!" request, talk to the blacksmith to learn about his available tool upgrades. You can select which one of your three tools you'd like to upgrade. Each tool has a total of seven upgrades you can complete. It will take you at least 5 years, plus 1 season, to do all 21 tool upgrades. Each of the upgrades will require you to bring him the previously upgraded tool and pay a fee. 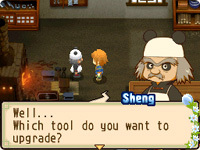 Sheng will return the tool to you shortly afterward, so you won't be without a tool for any amount of time. As the tools become higher level, Sheng will start requiring additional items. The Hammer and Axe are Item Requests and not Tool Requests. These two tools can not be upgraded at all. The Hammer request, "A Fine Hammer! ", will appear on the Konohana message board around Spring 12 of your first year and requires you to bring 8 Rocks to Sheng. The "A Fine Axe!" request becomes available after you have completed the Hammer request, Sheng has 200 or more friendship points, and it is the beginning of the next season. You will need to bring him 8 Branches and 8000 G to get the Axe. The best tool to upgrade first will be your Watering Can. The level 1 Watering Can only holds 20 water at one time and once you start growing crops in furrows, you'll find that you run out of water very quickly! Upgrading your Hoe, even just once, will make it easier to plow furrows if you can't get the button timing correct when using a level 1 Hoe.